For other uses, see Wheatgrass (disambiguation). Indoor-grown wheatgrass 8–10 days before harvest. Spelt grass grown outdoors. With a deeper green color than wheat. Wheatgrass is the freshly sprouted first leaves of the common wheat plant, used as a food, drink, or dietary supplement. Wheatgrass is served freeze dried or fresh, and so it differs from wheat malt, which is convectively dried. 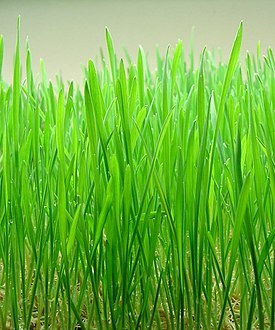 Wheatgrass is allowed to grow longer and taller than wheat malt. Like most plants, wheatgrass contains chlorophyll, amino acids, minerals, vitamins and enzymes. Claims about the health benefits of wheatgrass range from providing supplemental nutrition to having unique curative properties, but these claims have not been scientifically proven. The consumption of wheatgrass in the Western world began in the 1930s as a result of experiments conducted by Charles Schnabel in his attempts to popularize the plant. By 1940, cans of Schnabel's powdered grass were on sale in major drug stores throughout the United States and Canada. Ann Wigmore was also a strong advocate for the consumption of wheatgrass as a part of a raw food diet. Wigmore, founder of the Hippocrates Health Institute, believed that wheatgrass, as a part of a raw food diet, would cleanse the body of toxins while providing a proper balance of nutrients as a whole food. She also taught that wheatgrass could be used to treat those with serious ailments. Outdoor-grown wheatgrass grows slowly through the winter in a climate like that of Kansas in the United States. Wheatgrass can be grown indoors or outdoors. A common method for sprout production indoors is often on trays in a growth medium such as a potting mix. Leaves are harvested when they develop a "split" as another leaf emerges. These can then be cut off with scissors and allow a second crop of shoots to form. Sometimes a third cutting is possible, but may be tougher and have fewer sugars than the first. Schnabel's research was conducted with wheatgrass grown outdoors in Kansas. His wheatgrass required 200 days of slow growth, through the winter and early spring, when it was harvested at the jointing stage. He claimed that at this stage the plant reached its peak nutritional value; after jointing, concentrations of chlorophyll, protein, and vitamins decline sharply. Wheatgrass grown is harvested, dehydrated at a low temperature and sold in tablet and powdered concentrates for human and animal consumption. Indoor grown wheatgrass is used to make wheatgrass juice powder. Table 1. Nutrient comparison of 1 oz (28.35 g) of wheatgrass juice, broccoli and spinach. Data on broccoli and spinach from USDA database. Data on Wheatgrass juice from indoor grown wheatgrass. Extracting wheatgrass juice with a manual juicing machine. Wheatgrass is a source of potassium, dietary fiber, vitamin A, vitamin C, vitamin E (alpha tocopherol), vitamin K, thiamin, riboflavin, niacin, vitamin B6, pantothenic acid, iron, zinc, copper, manganese, and selenium. Wheatgrass is also a source of protein (less than one gram per 28 grams). The nutrient content of wheatgrass juice is roughly equivalent to that of dark leafy vegetables (see table 1). ^ Murphy, Sean (13 October 2002). "Wheatgrass, healthy for the body and the bank account". ABC Landline. Archived from the original on 2 December 2002. Retrieved 6 October 2006. ^ a b Meyerowitz, Steve (April 1999). "Nutrition in Grass". Wheatgrass Nature's Finest Medicine: The Complete Guide to Using Grass Foods & Juices to Revitalize Your Health (6th ed.). Book Publishing Company. p. 53. ISBN 978-1-878736-97-0. ^ Jarvis, William (15 January 2001). "Wheatgrass Therapy". The National Council Against Health Fraud. Archived from the original on 21 June 2018. ^ "4 Ways to Grow Wheatgrass". wikiHow. Retrieved 11 December 2013. ^ "Site Dedication and Construction Preliminaries, 1921-1923". Ahr-kc.com. Retrieved 2013-04-19. ^ "USDA Nutrient Database". Retrieved 6 November 2007. ^ "Wheatgrass". American Cancer Society. November 2008. Archived from the original on May 2, 2015. Retrieved February 10, 2017. ^ Shakya, Garima; Randhi, Praveen Kumar; Pajaniradje, Sankar; Mohankumar, Kumaravel; Rajagopalan, Rukkumani (June 2016). "Hypoglycaemic role of wheatgrass and its effect on carbohydrate metabolic enzymes in type II diabetic rats". Toxicology and Industrial Health. 32 (6): 1026–1032. doi:10.1177/0748233714545202. ISSN 1477-0393. PMID 25116122. Wikimedia Commons has media related to Wheatgrass. Bar-Sela G, Cohen M, Ben-Arye E, Epelbaum R (2015). "The Medical Use of Wheatgrass: Review of the Gap Between Basic and Clinical Applications". Mini Reviews in Medicinal Chemistry (Review). 15 (12): 1002–10. PMID 26156538. Shermer, Michael (August 2008). "How Anecdotal Evidence Can Undermine Scientific Results [aka 'Wheatgrass Juice and Folk Medicine']". Skeptic (column). Scientific American. 299 (2). Archived from the original on 2018-06-23. Retrieved 10 June 2018. This page was last edited on 15 April 2019, at 05:30 (UTC).